The Ultimate Pork and Beans BBQ - Now with Cabot Cheese! This hearty combination of our famous BBQ Ribs, Pulled Pork, Maple Baked Beans and Sharp Vermont Cheddar will please even the pickiest BBQ connoisseurs! 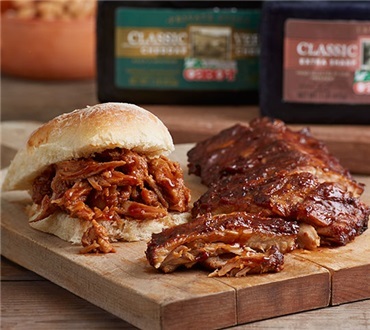 Both entrees are fully cooked, locking in the meats and sweet barbeque flavor; all you need to do is heat and serve. The tough part is deciding whether to enjoy it right off the bone or on a toasted roll! Either way, paired with our Maple Baked Beans and Creamy Cheddar Cheese, you are sure to be satisfied! I would buy this again. Excellent product. Easy to prepare for a party in a crock pot and served on slider buns. This is a special treat for us. We are retired, fixed income and value quality foods at a good price. This was an exceptional package and one we will order again. I would gift it to our children in a heartbeat as something they would enjoy, too. I was really surprised with the ribs and that totally made this a bad package. I can't believe I bought 1.12 pounds of bones, 2oz of sauce, and 4oz of meat. There wasn't enough to feed one person, so I opened the tub of beef, also not what I expected, that's like a soup. I had to go to the store and buy some lloyds ribs; which everyone enjoyed.I really thought those buns came with this, but they do not. If you try to put this on a bun, you'll fail, it is nothing like the picture.The cheese is excellent! The ribs are to-die-for. Tender, flavorful and meaty. This gift pack is one of my go-to selections for family members and it is always a hit!